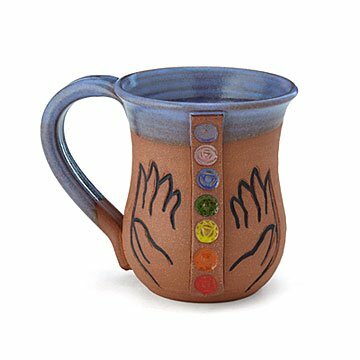 Celebrate movement, mindfulness, and coffee with Joanne Stratakos' handmade chakra mug. Nothing gets your mind and body ready for the day quite like morning yoga, but a big cup of somethin' caffeinated is a close second. Celebrate movement, mindfulness, and coffee with Joanne Stratakos' handmade mug. Painted with symbols for each of the seven chakras, or energy centers, it's a charming reminder to seek balance in everyday life. (And to seek your favorite roast often.) Handmade in Pennsylvania. 3.75" diameter x 4.5" H (5.5" L with handle); 16 fl. oz. capacity, Weight: approx. 16 oz.